This year’s Hallowe’en celebrations in Londonderry will offer the public the opportunity to explore the lunar landscape in unprecedented detail when the acclaimed ‘Museum of the Moon’ comes to the Guildhall from Saturday 28th until Tuesday 31st October. The ground breaking three dimensional globe by UK artist Luke Jerram is free to view and will be the centrepiece for the ‘Under the Samhain Moon’ theme of this year’s festivities. It features a giant, seven metre diameter, illuminated scale model of the moon suspended from the ceiling of the main hall of the Guildhall and complimented by a surrounding soundtrack created by BAFTA and Ivor Novello award winning composer Dan Jones. Detailed NASA imagery of the lunar surface has been used to create what the artist hopes will be the closest people can come to experiencing and exploring the moon while remaining on planet earth. “I wanted to make the artwork seem as authentic and realistic as possible to give the public the opportunity to fly to the moon,” Luke explained. “For most people, this will be the most intimate, personal and closest encounter they will ever have with it. “As a child I always wanted a telescope so I could study the Moon and the night’s sky. “Now with my own Moon, I can fly there, study every detail and share this experience with the public. Specialising in sculptures, large installations and live arts projects, Luke’s inspiration for the Museum of the Moon came from his daily cycles to work from his home in Bristol. “Bristol has the highest tidal range in Europe,” he explained. “There’s a 13 metre gap between high tide and low tide. “Cycling to work each day over the river to work, reminded me that it’s the gravitational pull of the Moon that’s making this happen. “I had the idea to create the Museum of the Moon some 15 years ago, but it was only until very recently that the data for creating the Moon imagery was made available by NASA. The project has been created by a number of creative organisations brought together by Luke Jerram and Norfolk and Norwich Festiva and has been created in partnership with the UK Space Agency, University of Bristol and The Association for Science and Discovery Centres. Further information about the Museum of the Moon exhibition is available at www.my-moon.org. The moon can be viewed for free by the public in the Guildhall on Saturday October 28th from 10am – 1pm and 4.30pm – 7pm and Sunday 29th – Tuesday 31st October from 10am – 12 noon and 4.30pm – 7pm. 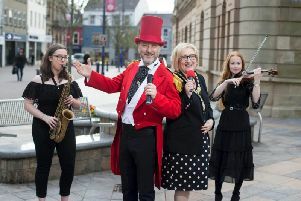 Halloween in Derry is organised by Derry City and Strabane District Council with support from Tourism NI Events Fund and the Arts Council or Northern Ireland. For more information and the full programme of events for this year’s Hallowe’en festival go to – www.derryhalloween.com.